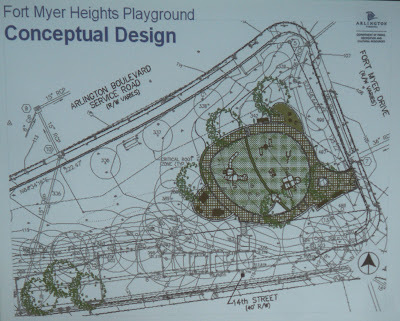 Arlington County park architect Aaron Wohler has developed an excellent proposed design for the new Fort Myer Heights Playground. The new playground will be installed in the lower area of the park along Ft. Myer Dr. Under the proposed design, the playground will emphasize naturalism with nature-themed playground apparatuses. The design will attempt to avoid silver-metallic fences, using brown-metal instead if available. On the side of the playground opposite Ft. Myer Dr. is planned two picnic tables and a barbecue. Enclosing the park will be a wheelchair-accessible, permeable-tile path. Within the park will be a naturally looking, artificial-turf, permeable surface. At the playground point nearest to the Arlington Blvd. & Ft. Myer Dr. corner will be a sand play area with a non-potable water pump. Alongside the playground is proposed a new-style, "leaf" bike rack that will nicely add to Rosslyn's array of styling bike racks. No changes will be made to the picnic area and basketball court in the 14th St. right-of-way. A major sewer line passes under 14th St., making any work in this area prohibitively expensive. The existing children's park above the basketball court, and the picnic table in the space above the park will be removed. Both those spaces will be converted into green space. Open green space will be preserved on the north end of the park and will connect to the existing green space on western side of the lower park. On the western side, the possibility of connecting the lower green space to the new upper green space will be explored. The proposed design will be formally presented to the neighborhood at the upcoming RAFOM meeting on September 20, 7pm, in the Prospect House Meeting Room (1200 N. Oak St.). The new playground will be complete next August, at the earliest. Whether the upper picnic tables and basketball court will remain open during the renovation remains to be negotiated with the construction company. "using brown metal if available" - why not just paint what's available brown??? According to the park designer, the steel will be powder-coated brown.